Charge iPhone 7 / 7 Plus and listen to music simultaneously. 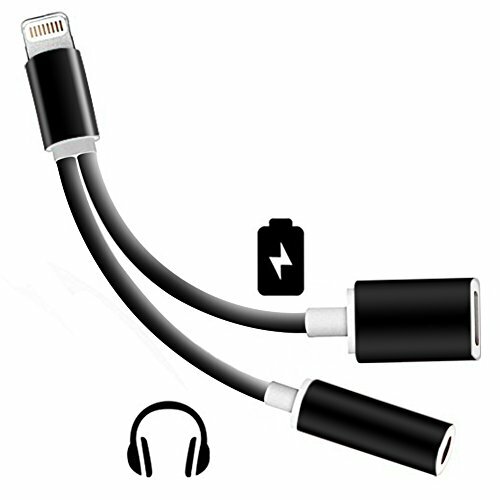 2-in-1 Adapter: 3.5mm for audio listening and Lightning connector for charging iPhone and iPad. Please note: using adapter disables audio/music control buttons on headphones/earbuds. Tired of your Apple lightning cable breaking apart at the connectors? Our 2 in 1 Lightning Adapters actually meet your requirement. Use it with your Apple iPhone, iPad or iPod and enjoy the freedom of being able to use your device on the bed or couch while it’s plugged in. Thanks to built-in strain relief reinforcements, you can move around easily without worrying about the cable disconnecting from the lightning or USB connector. Use your phone or tablet while it charges, even if the outlet is far away. No more dropping the phone or accidentally disconnecting the cable. Our 2 in 1 Lightning Adapters will make your iphone to reach its full function.